Icemen goalie Max Hasselbacher deflects a Bellingham shot from long range Friday night. The Lake Tahoe Icemen celebrate a goal by forward Paul Frys on Friday, March 23, against the Bellingham Blazers. There was a big collision at the Tahoe net Friday night, but did not result in immediate injuries. 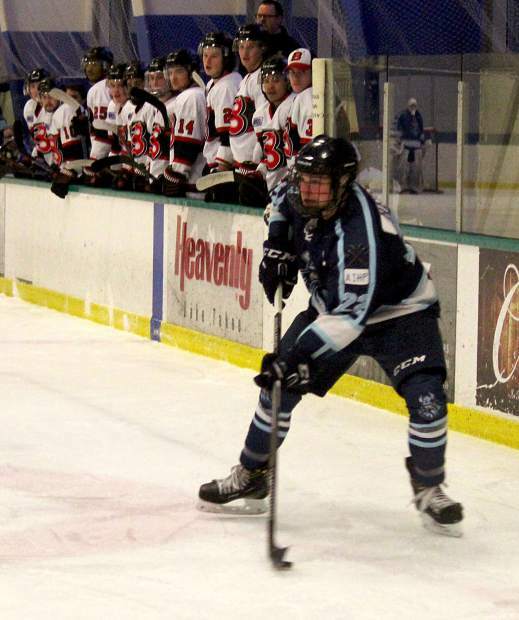 Icemen forward Paul Frys lines up a slapshot on Friday vs. Bellingham. 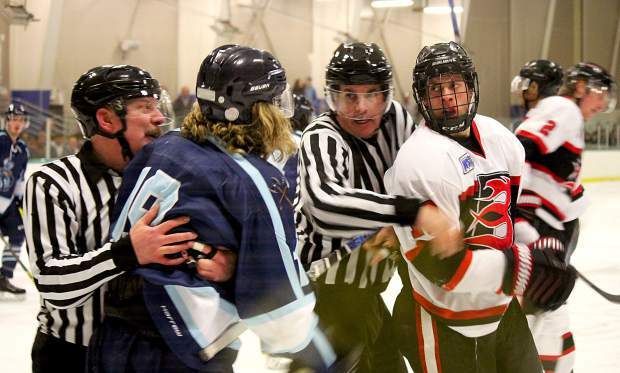 The series between Lake Tahoe and Bellingham was physical with referees trying to stop incidents from evolving into fights. Icemen team captain Phil Heisse looks to make a pass against Bellingham. 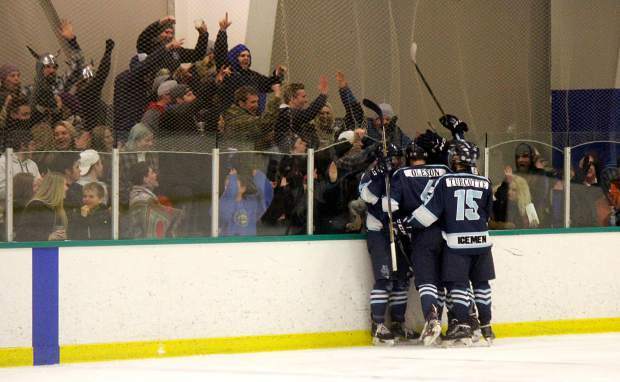 The Lake Tahoe Icemen celebrate Paul Frys' go-ahead goal Friday night. 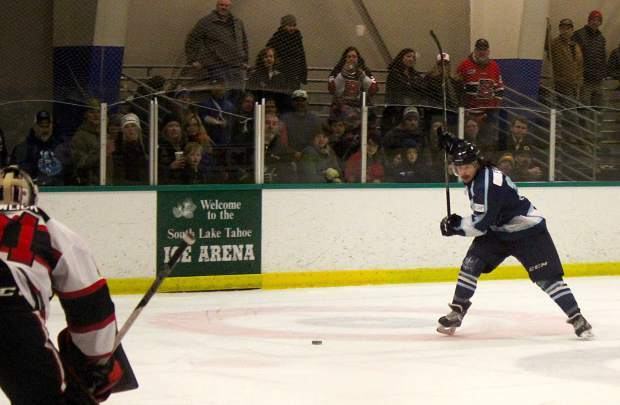 When the Lake Tahoe’s Danylo Moroz scored in the third period to break a tie game, the crowd at South Lake Tahoe Ice Arena went crazy. 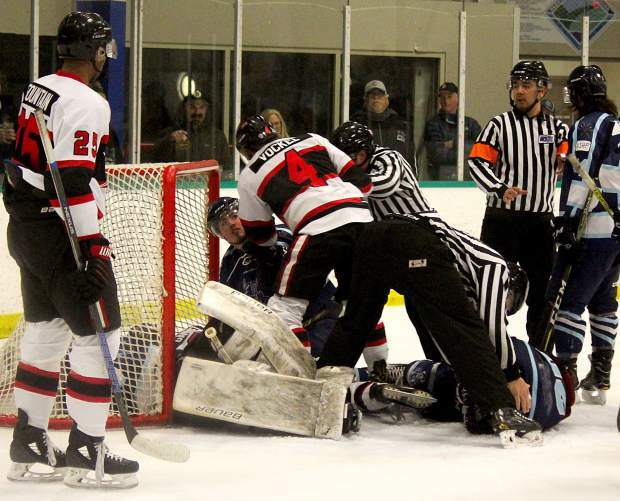 When Justin Poirer scored a couple of minutes later to make it a two-goal advantage, the packed house started singing, “Na na na na, na na na na, hey hey, goodbye,” signaling to the Bellingham Blazers that the game, and series, was over. In front of a loud, raucous, and sometimes obnoxious, home crowd, the Icemen swept the Blazers. 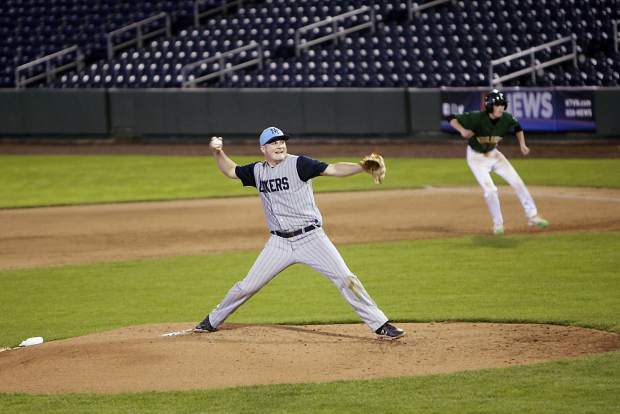 Lake Tahoe prevailed 5-1 Friday, March 23, and 9-6 the next day to win the best 2-of-3 series. Icemen forward Paul Frys, who entered postseason with a 30-game scoring streak, recorded a hat trick in the first game and scored twice and had five assists in the playoff series clincher, including assisting on the tie-breaking goal. The Icemen fell behind early in the opening game. The Blazers scored in just over a minute of the first period. But after the Icemen got their game legs after not having competed for three weeks. They dominated the rest of the way. Frys tied the game late in the first period then scored the game winner at 13:39 of the second period. Nick Davidow scored Tahoe’s third goal and Mitch Hunt added the final goal with just a few seconds left. Moroz added two assists for the Icemen while Davidow, Hunt, Phil Heisse and John Soliday all had assists. Tahoe goalie Max Hasselbacher made 24 saves and the Icemen put 50 shots on goal. In Game 2, the goals came fast and furious, especially in the second period where the teams combined for six goals, four by the Blazers, in a span of 4:35. Eight goals overall were scored in the second period. Moroz scored the game winner at 17:09 of the third period. He sparked a barrage of four unanswered goals that buried the Blazers. 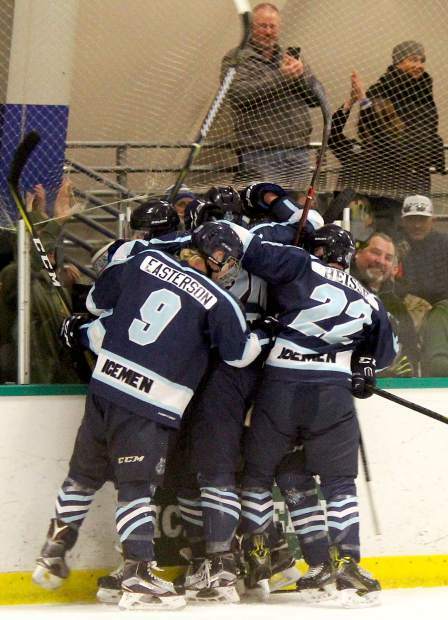 Poirier scored twice and Jackson Oleson, Easton Easterson, Locke Wischman and Hunt all scored for the Icemen. Moroz and Hunter Hansen had two assists while Oleson, Easterson, Hunt, Heisse and Soliday each had one. 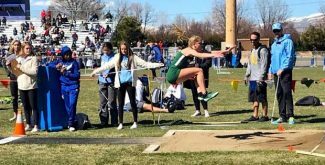 The teams combined for 40 penalties, Tahoe had 23, and 166 minutes in the box. Saturday night’s game started with a ceremonial puck drop from the Sierra-at-Tahoe Avalanche dogs, Hunter and Kopa. The Icemen next will have no small task in trying to advance to the next round and reach El Paso, Texas where the WSHL championship will be earned. 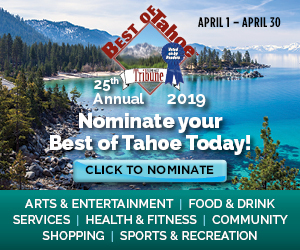 Lake Tahoe will face the top seed from the Northwest Division in the divisional finals, the Idaho IceCats, who have lost just four games the entire season. One of those losses was to the Icemen (4-3) in Tahoe. The teams have met nine times this season with six played on the South Shore. Idaho has prevailed eight times, with three of the wins coming by one goal. The series starts at 7 p.m. Friday, March 30, and continues Saturday at the same time. If each team wins a game, the deciding Game 3 will be held Sunday. Live game broadcasts can be viewed at wshlstats.com/WSHL_TV.php. Harper Dial contributed to this report.